From idea to series production-ready fiber composite solutions: At JEC World held from March 12 to 14 in Paris (Hall 6, booth R28), KraussMaffei is highlighting its leading system expertise in developing and implementing series production-ready processes for fiber-reinforced lightweight construction. The focus of the trade show appearance is on new processes and applications that are based on both thermoset and thermoplastic matrix materials. The FiberForm process, pultrusion and unidirectional (UD) tapes are front and center. 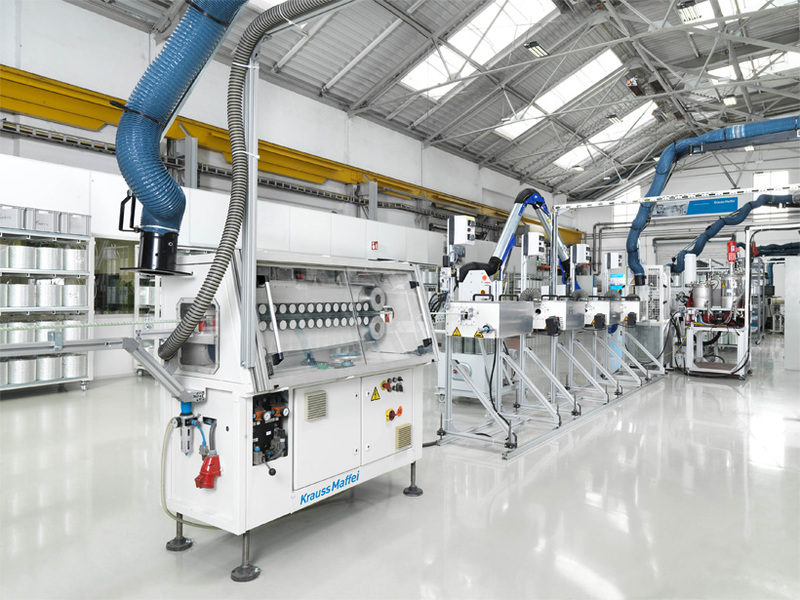 The KraussMaffei Group’s three technologies, Injection Molding Machinery, Reaction Process Machinery and Extrusion Technology, make it the world’s only provider that can cover all three technologies from a single source. “We give our customers advice independent of the process and accompany them along the entire journey, from idea to series production-ready fiber composite solutions. This expertise is what sets us apart, along with our experience and the worldwide references from serial producers. In doing so, we supply solutions along the entire process chain and work closely together with partners from the industry and research communities,” states Nicolas Beyl, President of the Reaction Process Machinery Segment at KraussMaffei Group. How can this system philosophy be converted into series production-ready processes? KraussMaffei highlights the answer with technologies such as the FiberForm process. Intelligent automation solutions and heating technology optimized for the injection molding process ensure cycle times from below 60 seconds. For the first time at JEC, a continuous-fiber-reinforced thermoplastic series-produced lightweight component with a unit quantity of over 1 million per year is being exhibited. It is manufactured by forming and back-injecting stable fiber-reinforced composites, known as organo sheets. The organo sheet, which is only 0.5 mm thick, ensures the required stiffness with a low dead weight and makes a major contribution to weight savings (up to 4 kg/vehicle). The injection molding process helps the dimensional compliance of the geometry and is responsible for the additional component functions. An additional sample component from a research project with the Dresden University of Technology demonstrates the use of recycled materials such as recycled carbon fibers and remanufactured compounds. In another groundbreaking innovation, the injection molding production technology called foam molding was implemented on a complex geometry. This technology makes it possible to produce thermoplastic sandwich structures with fiber-reinforced cover layers in a one-shot process. 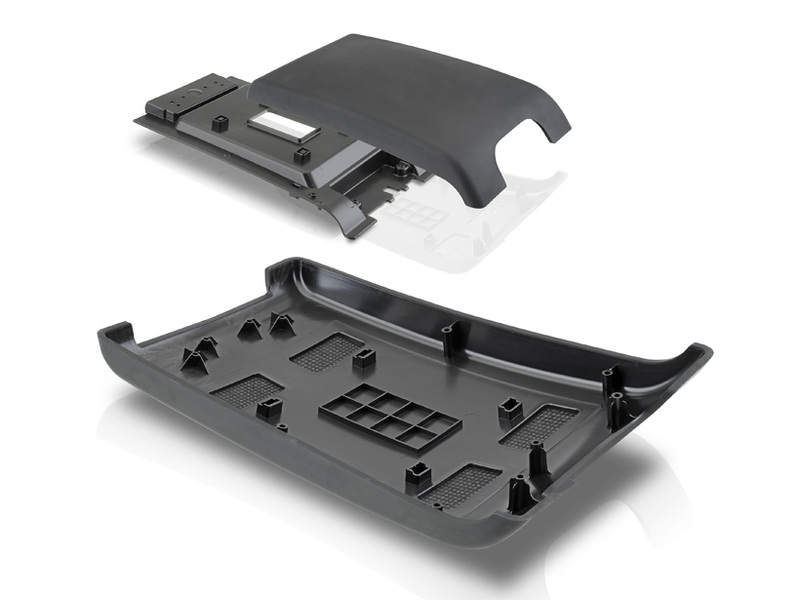 The third application, a successful combination of FiberForm and swivel plate technology for multi-component injection molding, is a center armrest for the automotive interior. It will be on display in the Planet Area Automotive at JEC. “This combination can be used to create completely new visual and haptic component features for thermoplastic composites in a single process. The TPE component gives the functional and visible parts of the center armrest an outstandingly soft and visually appealing surface,” explains Dr. Mesut Cetin, Group Product Manager at KraussMaffei Automation. In turn, the use of the composite sheet increases the rigidity and strength of the component. This enables the reinforcement ribs and the component itself to be designed with thinner walls, cutting weight by approximately 20 percent and cutting costs by around 15 percent. Another highlight at the KraussMaffei booth is the presentation of the iPul technology from KraussMaffei Reaction Process Machinery. With the system solution launched on the market in 2017, the company has set new standards in pultrusion, a continuous process for fiber-reinforced profiles and round bars. The iPul system faster production speed compared to usual open bath processes. “Our iPul system is exactly what the times demand. The new technology is attracting massive interest in the construction industry, for example for window profiles or rebar in concrete, or in wind power. In this field, we recently got a series order for a large project in Russia,” confirms Philipp Zimmermann, Head of the Composites/Surfaces Business Unit at KraussMaffei. However, the automotive industry offers a great deal of potential, as does the energy and power supply sector. “In this field, we’ve launched two forward-looking development projects with Tier1 suppliers and the Fraunhofer IGCV. Here, pultrusion’s true strength is on display: cost-effective production of fiber composite profiles with a low barrier to entry in terms of investment in systems and tooling. This makes lightweight construction as attractive as can be,” states Zimmermann confidently. The new iPul series is KraussMaffei’s first bold foray into the field of complete turnkey systems where the systems, process and mold technology are from a single source. The series features central control of important process parameters such as the output capacity and draw-off speed. A further benefit of iPul is the great flexibility and precision of the systems. The injection box and metering technology with a newly developed mixing head make it possible to process completely different resins, including even polyurethane systems. The long-fiber injection process is KraussMaffei’s established series system solution for fiber-reinforced lightweight construction. “The long-fiber injection process is ideal for large-format, complex and simultaneously thin-walled parts. Typical end applications include finishers for trucks, commercial vehicles and agricultural machines. Here, we continue to see incredible potential in the market, particularly in China and the US,” says Zimmermann. The high degree of automation ensures short cycle times. The high fiber volume content of up to 50 percent guarantees high component stability and low weight at the same time. LFI components feature high temperature stability and excellent impact strength and have surfaces that can be used directly off-mold. 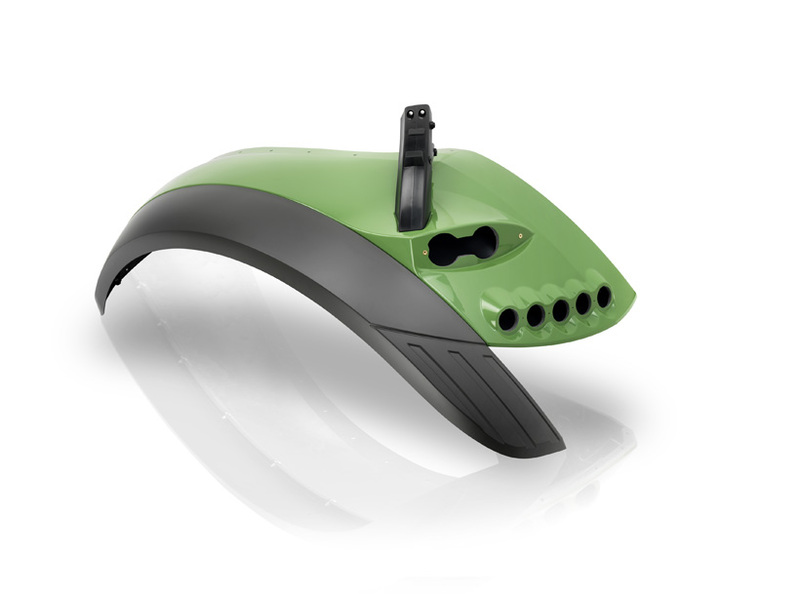 At JEC, KraussMaffei is presenting a series component for a tractor side cover. Extrusion specialists KraussMaffei Berstorff have raised their game even further in the FiberForm process with UD tapes. UD tapes feature unidirectional reinforcement fibers made of materials such as glass or carbon that are embedded in a thermoplastic matrix. “UD tapes are the ideal basis for organo sheets for the FiberForm process. We can’t wait to show customers our rock-solid system expertise at JEC. We’re taking our expertise from extrusion and thermoplastic lightweight construction and bundling it with injection molding technology to develop new and ingenious solutions in lightweight construction,” states Hilmar Heithorst, Product Manager at KraussMaffei Berstorff. Another important application for UD tapes is in thermoplastic composite pipes (TCP). A TCP system wraps UD tapes around plastic pipes and then melts the layers. This composite material and the orientation of the longitudinal fibers gives them incredible pressure resistance and makes them exceptionally well suited for the requirements of the oil and gas industry.